CT scans of the thorax and abdomen showed multiple air-ﬁlled bowel loops with mesentery in the right hemithorax causing signiﬁcant mediastinal shift to the left (Figure 1). 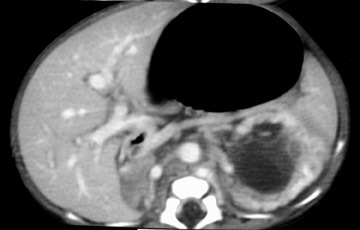 The right kidney was seen in a paraspinal location in the right hemithorax, and mesenteric fat with vessels was seen in the ipsilateral renal bed (Figure 1). 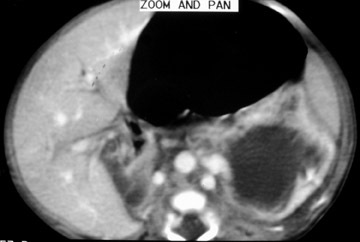 The left kidney showed features of obstruction at the pelviureteric junction: gross hydronephrotic changes and delayed contrast excretion with nonvisualization of the left ureter (Figure 2). The stomach appeared grossly distended with an altered axis likely due to the associated malrotation and volvulus (Figure 2). Further review of the CT scans also revealed the presence of 2 venous channels on either side of the aorta in the infrarenal segment with a retroaortic left renal vein draining into the right-sided channel (Figure 3). The intrahepatic inferior vena cava (IVC) and hepatic veins were well seen. These ﬁndings suggested duplication of the IVC (with 2 similarly sized vena cavae), and the left IVC was seen draining into the right IVC via the retroaortic left renal vein. Corrective surgery was attempted using a subcostal abdominal approach (which is usually preferred over a transthoracic approach). Although no hernia sac was noted, the diaphragmatic defect was repaired after reduction of the herniated contents. The stomach volvulus was untwisted, and no gastropexy was done. Correction of the left pelviureteric junction obstruction (pyleoplasty) was reserved for a later stage. At 3- and 6-month follow-up examinations, the infant was asymptomatic and thriving. Congenital diaphragmatic hernia (CDH) is a complex developmental anomaly associated with substantial morbidity and mortality despite advances in postnatal care. The major prognostic factors are the presence of associated structural or chromosomal anomalies and the herniation of liver into the thorax. Similarly, the complicated embryogenesis of the IVC provides numerous opportunities for developmental errors. Anomalies may involve the infrarenal, renal or suprarenal segment of the IVC. Here, we present a case of right-sided CDH with concurrent anomaly of the infrarenal IVC causing left pelviureteric junction obstruction. Color Doppler can help to deﬁne which organs have herniated in fetuses with diaphragmatic hernia—it can depict an abnormal course of the right renal artery, arising from the aorta and feeding the intrathoracic right kidney or can delineate portal or hepatic veins within the herniated liver. Right-sided CDHs seem to cause less severe symptoms than those on the left.5 They may manifest beyond the neonatal period with respiratory or gastrointestinal symptoms or may be detected in adulthood incidentally. Rarer presentations of right-sided CDH include superior vena cava syndrome and congenital bronchobiliary ﬁstula. Duplication of the IVC is a rare anomaly of the infrarenal segment (due to persistence of the supracardinal veins), with an incidence of 0.2% to 3%. 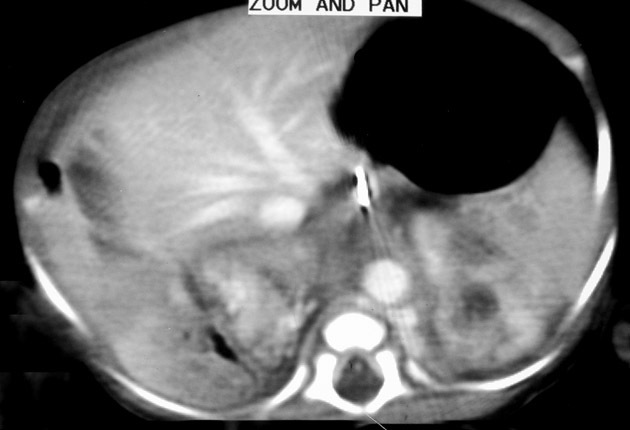 It is known to be associated with various urogenital tract anomalies,6 as seen in this case in which the child had a left pelviureteric junction obstruction associated with duplicated IVC. This rare association has been reported in the literature.7 It is postulated that the subcardinal and supracardinal system form extensive anastomotic channels at the level of the renal vein and that the persistence of one of these midline anastomoses could result in pelviureteric junction obstruction; however, the occurrence of these anomalies in a case of CDH has not been reported before. Congenital posterolateral diaphragmatic hernia is widely regarded as an isolated defect, but this view is incomplete. Defects in morphogenesis are widespread and heterogeneous. Most often, the abnormalities involve the heart, brain, genitourinary system, craniofacial region, or limbs. Patients with CDH should be evaluated carefully for additional defects, as their presence has a signiﬁcant impact on management and prognosis. Gale ME. 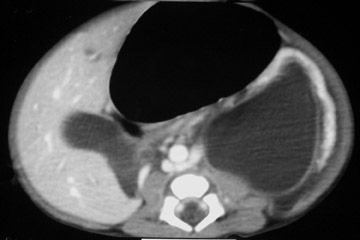 Bochdalek hernia: Prevalence and CT characteristics.Radiology.1985;156:449-452. Sener RN, Tugran C, Yorulmaz I, et al. 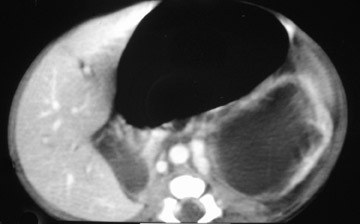 Bilateral large Bochdalek hernias in an adult. CT demonstration. Clin Imaging. 1995;19:40-42. King SJ, Pilling DW, Walkinshaw S. Fetal echo-genic lung lesions: Prenatal ultrasound diagnosis and outcome. Pediatr Radiol. 1995;25:208-210. Shinmoto H, Kashima K, Yuasa Y, et al. MR imaging of non-CNS fetal abnormalities: A pictorial essay. RadioGraphics. 2000;20:1227-1243. Daher P, Zeidan S, Azar E, et al. Right congenital diaphragmatic hernia a well-known pathology? Pediatr Surg Int. 2003;19:293-295. Rahalkar MD. Serendipitous detection of IVC anomalies. Ind J Radiol Imag. 2002;12:109-114. 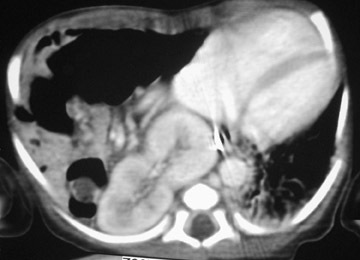 Mani N, Venkataramu NK, Singh P, Suri S. Duplication of IVC and associated renal anomalies. Indian J Radiol Imaging.2000;10:157-158. Congenital right-sided Bochdalek hernia. Appl Radiol.